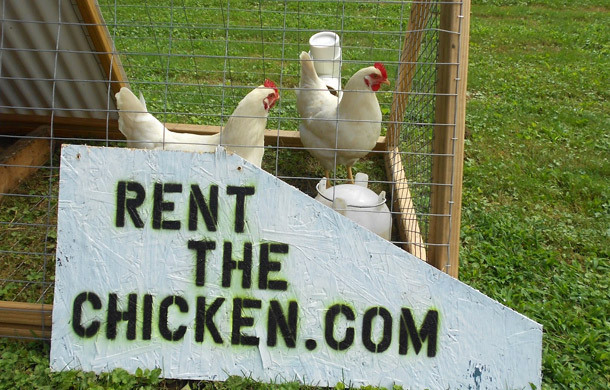 Rent the Chicken is the innovative brainchild of Phillip and Jenn Tompkins of Freeport, Pennsylvania. Catering to the urban farming trend, the Tompkins let customers rent two egg-laying hens and all of their supplies, and provide an in-person lesson on urban chicken farming and maintenance. The Tompkins say their business takes the commitment out of raising egg-laying hens from the time that they’re chicks, and helps cut down on the number of chickens that get abandoned in shelters. They deliver and pick up the hens and all supplies within a 50-miles of their hometown and will replace chickens that get eaten by predators, but they’ll take away your chicken rental rights and charge you a fee if the chicken dies because of neglect. Why “Rent The Chicken”? We provide all of the supplies you need with the rental: portable chicken coop, two egg laying hens, enough food for the length of your rental, food & water dishes as well as instructions on how to keep your chickens happy! Within two days of the arrival, your chickens will lay eggs ready to use! These eggs have 1/3 less cholesterol, 1/4 less saturated fats, and 2 times more omega 3 fatty acids than store bought eggs. Your Rent The Chickens should lay 8-14 eggs per week. You will know exactly what your chickens eat!